Food I love enough to share. I hosted my monthly book club this past Sunday night and, as it’s the host’s duty to provides some nosh, I spent a couple days prior scouring my cookbooks for ideas. It’s a very forgiving group of gals so there was no real pressure except what I imposed upon myself, but I still wanted to make something delicious and impressive. The book du mois was “Cutting for Stone” by Abraham Verghese (an AWESOME read). Now, when I host the group, I sorta like to theme my snacks and appetizers around the book in some way. However, this story took place mostly in Ethiopia. Not being very familiar with Ethiopian cuisine, although I have eaten it a time or two, I was at a loss. To turn up the heat even more, one of the book club members has actually lived in Africa in Tanzania, so I knew she would have some idea whether the food actually tasted authentic or not. After much deliberation, I finally decided I would make a lamb tagine, which is a meat or vegetable stew with dried fruit, olives and preserved lemons. Granted, this is really considered a North African dish more than Ethiopian, but I figured just being on the same continent would earn me some credibility. Technically, tagines takes their name from the domed clay cooking vessel they’re prepared in. The closest thing I had was a crock pot. C’est la vie. The recipe came to me from my old trusty electronic files. Several years ago on a trip to Ireland, I happened to catch an episode of a BBC show called “Two Hairy Bikers.” (You think I’m joking. See for yourself — www.hairybikers.com.) This is a travel/cooking show that follows these two hirsute gentlemen around on their motorcycles to foreign lands where they introduce viewers to the regional cuisine. 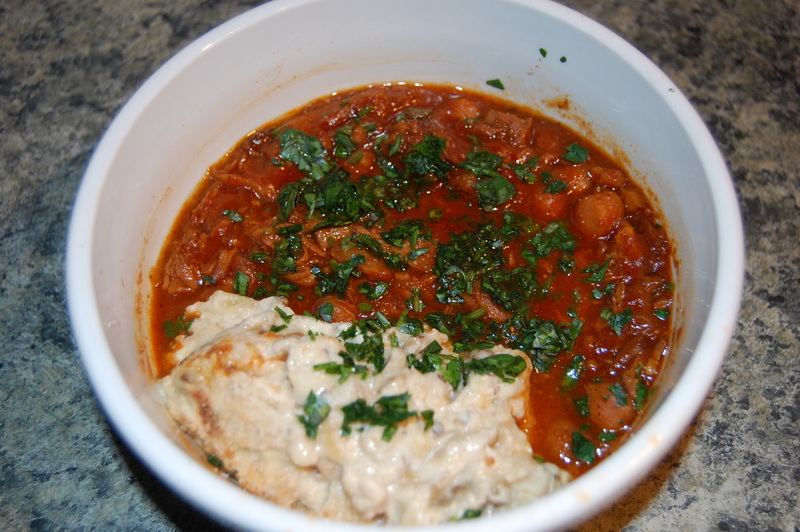 I had flagged a recipe for something called “Sultan’s Delight” that was sort of like what I had in mind, although upon closer examination, it was actually a Turkish dish. Dang. Can’t win for losing. At this point, my time for waffling was running out and I decided it would have to do. As it turned out, the stew was darn tasty. Not all that different from a good beef stew, but the lamb gave it a richer, gamier flavor and the seasonings were more distinctive with cinnamon, cumin and allspice. I took a few liberties, as I usually do with recipes like this, and threw some chickpeas and chopped figs into the mix. They proved good additions, but as the figs cooked down and disintegrated, the seeds gave the whole dish a slightly grainy texture that I could have done without. The flavor, though, was delicious. On the side, the Hairy Bikers served their stew with creamed eggplant (or aubergines, if you want to explore your British side). And who am I to argue with the wisdom of a Hairy Biker? I don’t know about you, but I’d eat an old shoe if it’s topped with cream and some cheese. This dish is really just roasted eggplant that’s been peeled, smushed and stirred into a béchamel sauce. I threw mine into a small Corning Ware casserole dish, topped it with breadcrumbs, browned it under the broiler and served it with crunchy pita chips as a warm dip. Yummy. One of my friends (the one who’d lived in Africa!) liked it so much, she said she could have sucked it up through a straw. I’d say I can safely chalk that up as a win! For months, my friend Laura has been raving about the “best caramel corn EVER,” and urging me to try some. I finally got around to it, and turns out, she’s right. Inga’s Popcorn is pretty damn tasty, and hard to keep your hands out of. 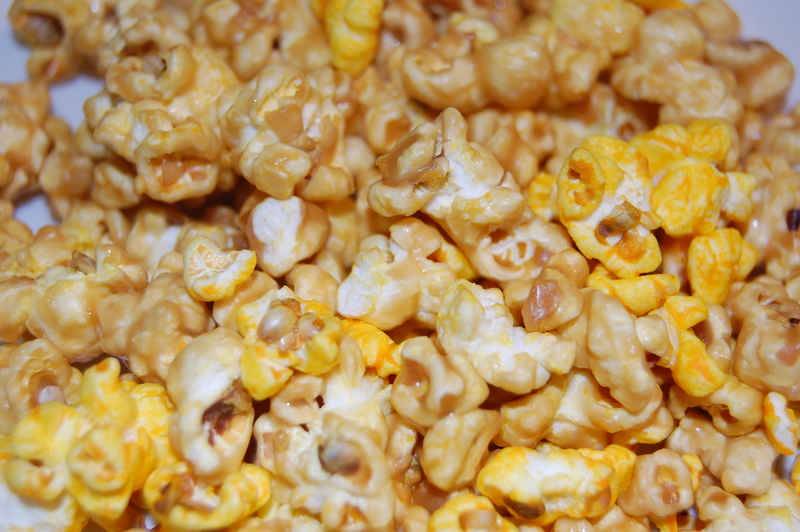 Using family recipes, Inga has created some really delicious caramel corn variations, not to mention cheesy varieties (try the jalapeno cheddar!). A Chicago Combo Mix of caramel and cheddar offers the best of both salty and sweet worlds if you just can’t get off the fence. Or if you have PMS. 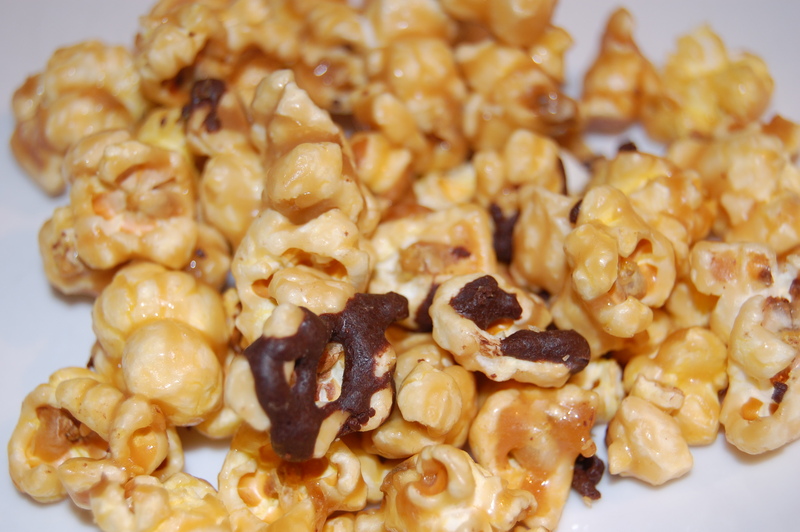 I sampled the Chicago mix and the new Chocolate Lover’s Delight – a wickedly yummy caramel corn drizzled with ribbons of dark chocolate. Both were so delectably light, they very nearly melt in your mouth. Inga’s secret ingredient? The popcorn itself. For her concoctions, Inga uses only a special kind of organic popcorn grown by Mozingo’s Farms in nearby Brownsburg. This particular strain of corn somehow pops up incredibly fluffy with very little hull to wind up stuck in your teeth. Inga’s is based in Zionsville, and you can find her various flavored popcorns in stores scattered throughout the village and at the Zionsville farmer’s market. The company just opened a shop in Bloomington to boot, and you can also order popcorn online via her web site. For more information about how to get your hands on this addictive stuff (and trust me, you want to), visit www.ingaspopcorn.com. On a side note, a few weeks ago, Laura gifted me a bag of ground cornmeal from Mozingo Farms that’s been sitting in my freezer begging to be used. This week, I busted it out to make some chili-accompanying bacon cheddar corn muffins. However, I think my ratio of cornmeal to flour was off and they turned out way too doughy. I also used a tiny bit of the cornmeal to dust the pan beneath a homemade pizza last night, and it added a fantastic hint of toasty crunch. Tonight’s experiment – polenta. And a really great one, as it turned out. 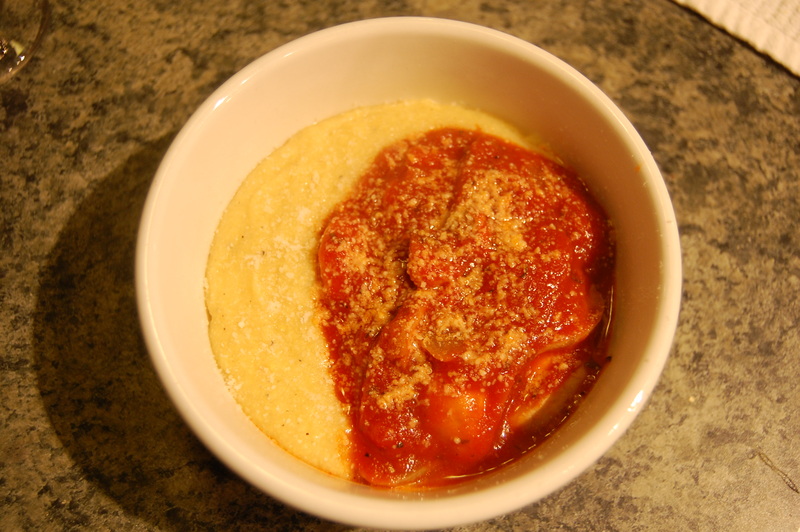 I’m not well-versed in polenta, so this was an experiment. One I’d eagerly undertake again. I’m also wondering what the difference is between polenta and grits. Anyone? Please feel free to chime in here, readers. From what I can tell, they’re basically the exact same thing, but I’m all ears if you know the difference and want to set me straight. Polenta, as it turns out, is easy peasy to make, requiring a list of ingredients you can count on one hand and a wee bit of patience. All you do is bring some water and salt (or if you’re me, half water and half chicken stock) to a boil, stir in the cornmeal and then keep on stirring until it loses its grit and becomes soft and velvety, about 20 minutes or so. If it’s too thick you just add a little more liquid to keep things rolling. Also, if you’ve got a splatterguard in your possession, you’ll want to put it to use here. The consistency of this stuff is like molten lava and you do NOT want it splashing up onto your skin. Definitely not a cook-while-naked dish. When the polenta has reached a silky texture, not unlike mashed potatoes, throw in as much butter as you dare and maybe some cheese. Spoon it onto your plate or into your bowl and top it however you like – standard spaghetti sauce, sautéed veggies, chili… go crazy. I whipped up a quick marinara of sorts with mushroom and onions and it was fab. If you prefer, you can spread the polenta out into a baking dish while it’s still warm, let it set up, then cut it into squares and eat it that way. Heck, you can even fry the squares lightly in a little olive oil if you really want to kick things up. This is also a surefire way to entice the kids to eat it if yours, like mine did, turn up their noses and refuse to take a taste of the more porridgey version. A great, easy recipe to have in your bag of tricks. Try in as an alternative to pasta or mashed potatoes sometime and report back. At hubby’s suggestion, we have decided to institute a new weekly tradition this winter — the Sunday roast. While we usually sit down as a family to eat most of our meals, the Sunday roast takes things one step further by adding an increased sense of reverence and occasion. The Sunday roast concept is nothing new where hubby comes from, and as we explore recipes and menus, I find it’s not much different than the family meals I grew up eating. Meat-and-potatoes-centric, heartwarming comfort food that’s perfect for cold winter days and nights. For our first Sunday roast effort last weekend, we went the very traditional route of pot roast with potatoes and carrots. It turned out well, very much like the wonderful meals we’ve eaten at my mother-in-law’s house in Ireland, right down to the jus-based gravy. In between the two Sundays, our Thanksgiving dinner consisted of a roast chicken (we had a very small crowd), stuffing, cranberry sauce and green bean casserole. No sooner did we get those leftovers polished off than it was time to think about the Sunday meal. Yesterday, we branched out to try something more ambitious – stuffed pork loin with roasted potatoes and Brussels sprouts au gratin. For a little while, I was concerned we’d bitten off slightly more than we could chew. At one point, the kitchen was a total mess, every pot and pan was dirty, and hubby and I found ourselves up to our elbows in pork trying to butterfly, stuff and truss the loins. However, the beauty of a roast is that once you get all the prep work done, you have some time to chill while your dinner just hangs out in the oven for a few hours getting all tender and delicious. The pork loin was great, albeit the spinach/mushroom filling could have used a little more flavor punch and the meat was just the teeniest bit dry. Hubby made a good call by insisting we leave the outer fat layer on; I was all set to cut it off when he stopped me. 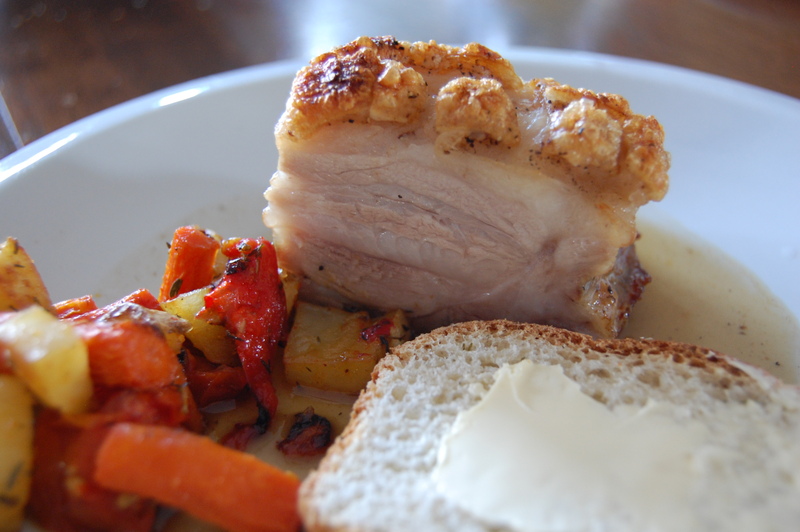 In the end, the fat crisped up nicely to create a yummy, salty pork rind-esque crackling on top. Lesson learned. 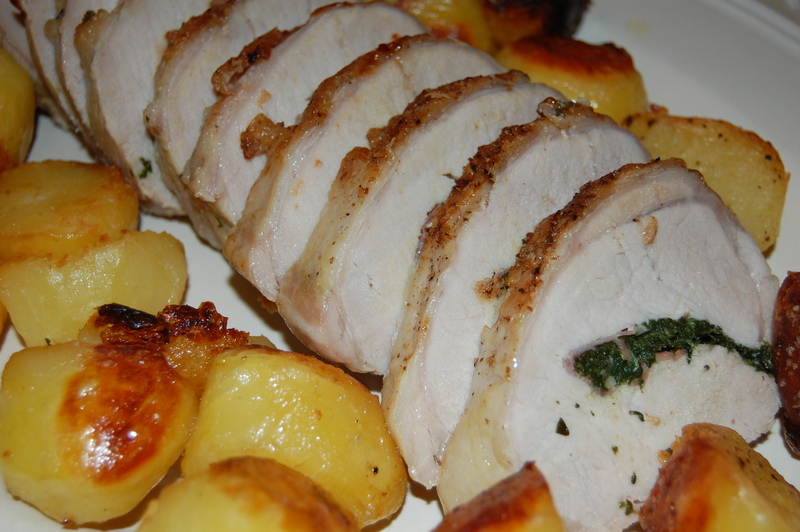 We’re already plotting our next pork loin attempt with a pesto/proscuitto filling. A roasting tip from yours truly: invest in a good meat thermometer. I don’t know what I did before I bought my digital version. Overcooked a lot of meat, I suppose. Pull your roast out of the oven a few degrees shy of your target temp, cover it with a piece of foil and let it rest for 10 or 15 minutes before you slice in. You’ll have a juicy roast every time. 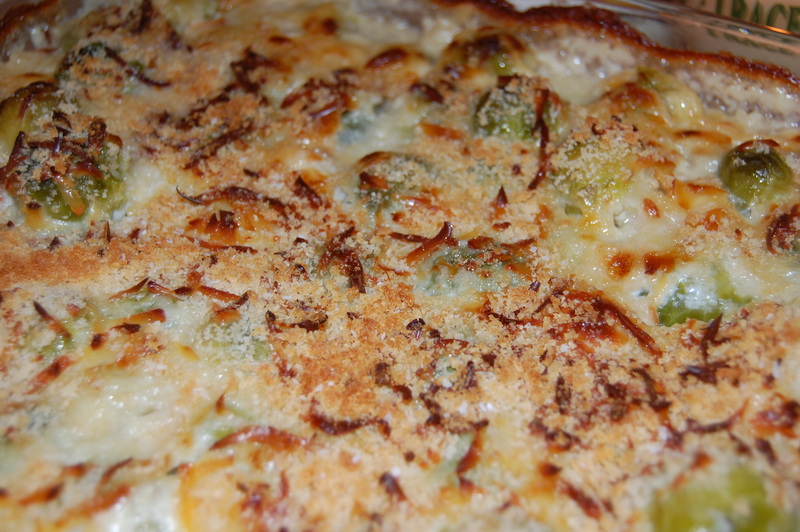 The Brussels sprouts au gratin was another successful experiment, I thought. Much like my feeling that you can convert haters into believers by oven-roasting vegetables, drenching them in a cheesy cream sauce and baking until bubbly works well, too. The veggies, not the haters, of course. We’ll be out of town this coming weekend, but we’re already discussing new roast ideas for the following Sunday. Haven’t done lamb yet, or maybe a side of salmon? You never know what you might find on our table next. Think you don’t like vegetables? Think again. I’m of the mindset that you can take almost any veggie, drizzle it with a little olive oil, sprinkle on some s&p and roast it into a state of crispy deliciousness. Carrots, parsnips, Brussels sprouts, broccoli, asparagus… even if you hated them with a passion as a child, it might behoove you to give them another shot. The only vegetables I can remember growing up with were canned corn and iceberg lettuce salad with a few cucumber slices. Tomatoes? No way. Green beans. Uh uh. I turned up my nose at anything and everything of the fresh-picked persuasion. My veggie phase began in college, when one day, I added some frozen broccoli to my beefy Ramen noodles just for kicks. It was a real revelation, let me tell you. I’ve come a long way since then, baby. These days, I eat the heck out of some fresh produce, and the more colorful, the better. My salads are things of beauty. I love going to farmers markets and browsing the booths to see what’s fresh and in season, and am trying my darnedest to get my little guys on board with veggie appreciation as well. Take kale, for instance. I don’t know much about kale. I can’t recall ever eating kale. But when I saw beautiful bunches of it at the opening weekend of the Indy Winter Farmers Market on Saturday, I couldn’t resist picking up some to experiment with. 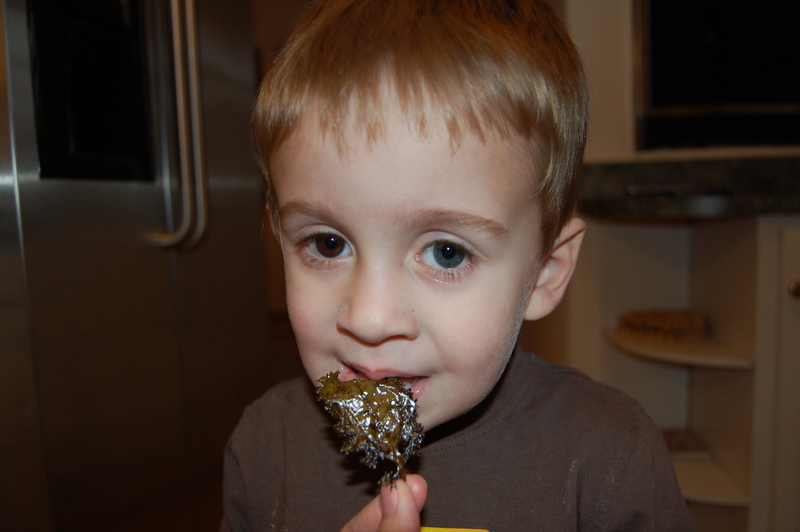 Lo and behold, I quickly located recipes online for kale “chips,” and I was off and running. Basically, all you do is wash the leaves and use the above-mentioned technique to bake them off. 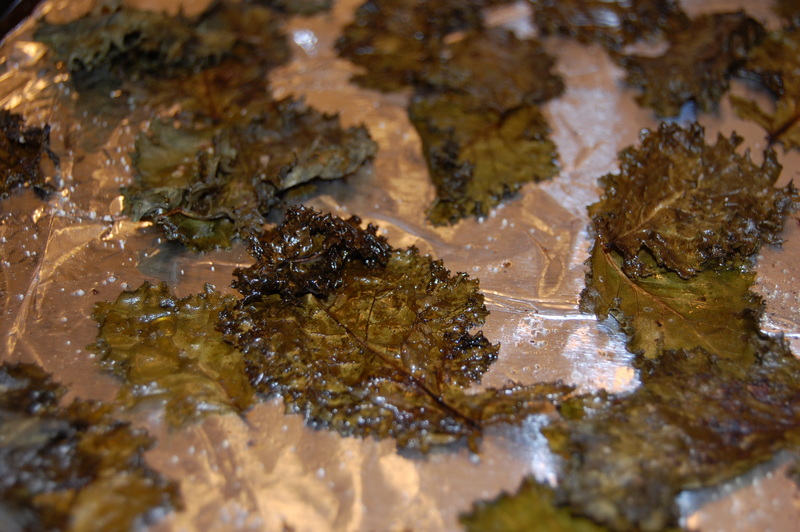 After about 15 minutes in the oven at 350 degrees, they dehydrate into paper-thin crisps. They actually shrunk so much, I really could have afforded to do another baking sheet full, but then again, they only had to serve myself, a friend and the toddler as part of a bigger-picture dinner. So for a trial run, they worked out just fine. 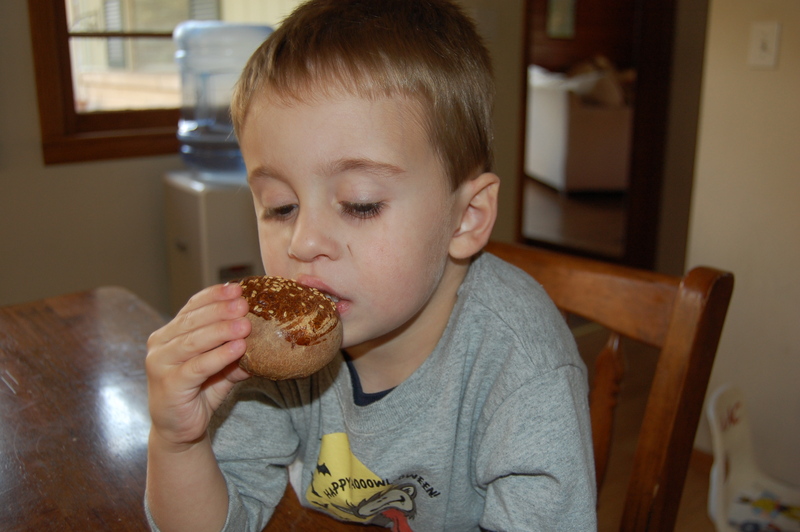 an adventurous eater in the making? My herb garden grew like crazy this year and, unwilling to see all that fresh fragrant beauty go to waste, I decided to try my hand at drying some of the more prolific plants. Namely, thyme and rosemary. I tried to oven-dry some herbs a couple years ago, which ended up being a lot of effort for very little result. 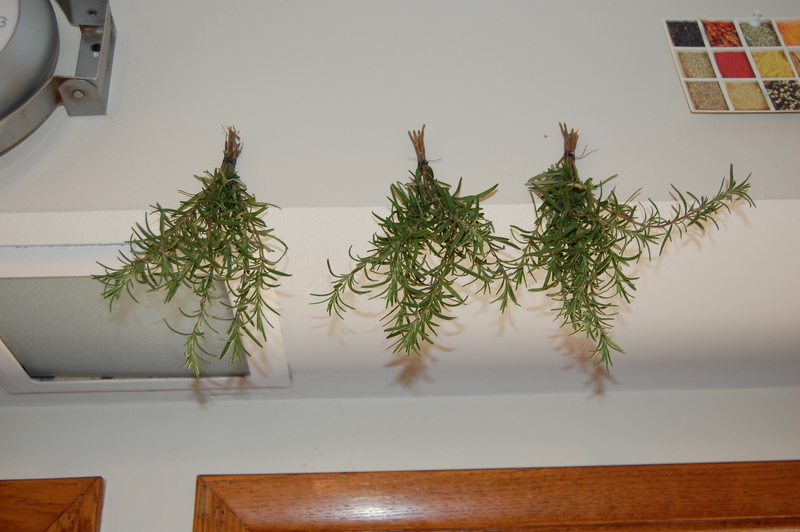 This go-round, I’m taking the lazy route and just hanging the herbs in my kitchen to dry organically. It’s a pretty easy process, really. Rinse your herbs and dry them completely, then strip the lower two inches of the stems and tie together in small bouquets. Hang in a dry, airy spot out of direct sunlight and wait for the magic to happen. When they’re completely dry (10 days to two weeks from what I reckon), crumble them free from the stems and store in an airtight glass jar. Penzey’s Spices sells them in several sizes if you’re looking. The online how-to guides I found were split on whether to cover each bunch with a brown paper bag or not to keep them free from dust. I decided not. 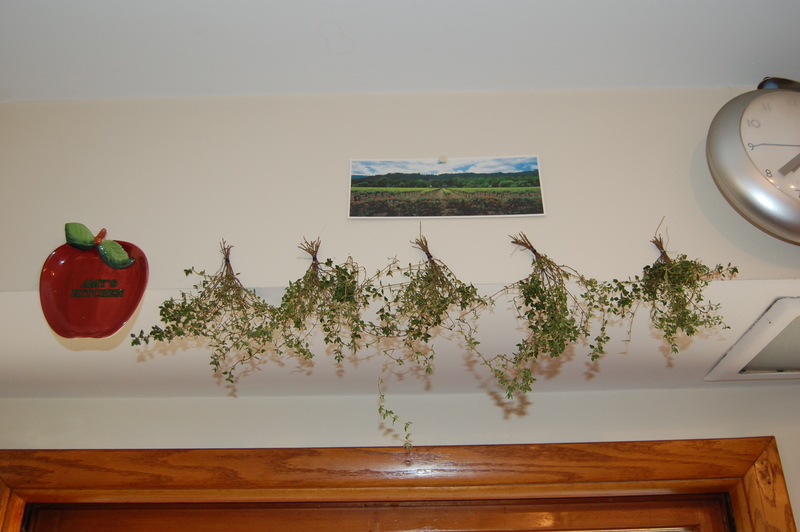 We keep our house clean and, with any luck, the herbs won’t be hanging around long enough for spiders to nest in them. My little bundles already smell yummy and they look adorable in my kitchen, adding a nice rustic touch. I’ll keep an eye on them and in a couple weeks, should be stocked up with enough seasoning to see us through the weekly Sunday roast tradition we’re planning to initiate this winter. It’s been quite the day of culinary experiments in my house. Hubby decided he was in the mood to expand his already-respectable cooking repertoire and settled on Gordon Ramsay’s pork belly recipe as his adventure of choice. However, he quickly found out pork belly is harder to find in Indianapolis than a shred of hope for this year’s Colts team. The guys at Kincaid’s finally came through with a cut and I was subsequently banished from the kitchen while hubby got down to business. If I remember correctly, I believe I got this recipe from my mom years ago, but I don’t recall her ever actually making it. Thinking it would be a fun activity to share, I enlisted the toddler to help. My little sous chef did a surprisingly good job, and was pleased as punch to help me measure out ingredients, stir them together and even knead out a little loaf of his very own. Recipes that require things like yeast and precise timing intimidate me a little bit. 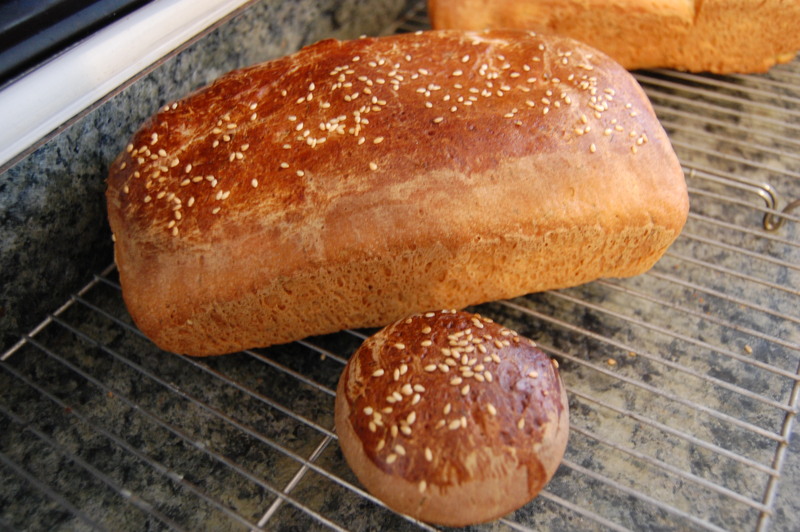 Even though I’ve made bread before, I couldn’t help but fear throughout the whole process that I was doing something terribly wrong and would wind up with flat loaves as hard as hockey pucks. 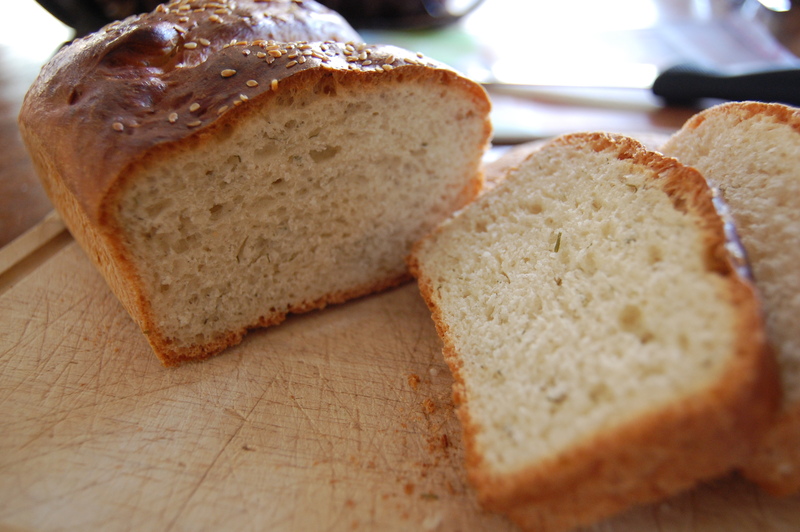 Have to admit, I was pleasantly surprised at how simple this bread was to make. There’s not much to it, really, not many ingredients and quite a bit of downtime in the middle. I mixed the dough, kneaded it smooth (a very soothing tactile motion, if you ask me) and put it in a bowl on top of the stove to proof. Happily, it rose like magic. I let it double and punched it down as per the directions, brushed it with egg white and let the toddler sprinkle sesame seeds on top. 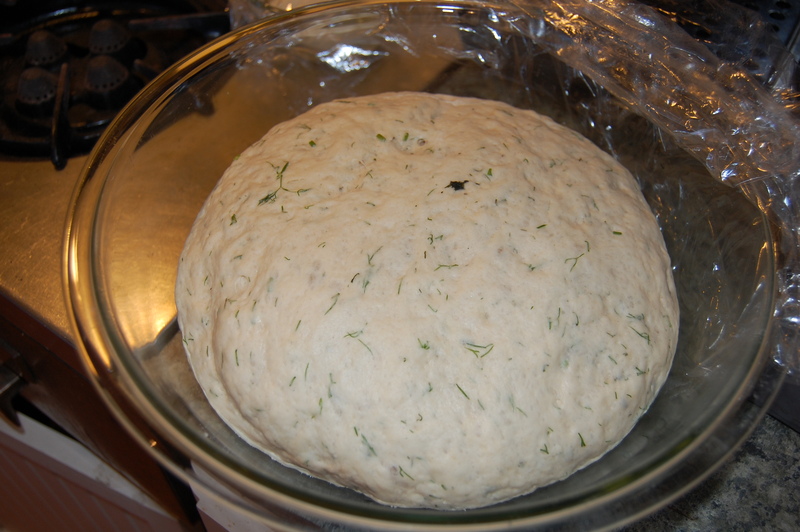 Into the pans for a second rise, and then into the oven it went. Thirty minutes later, voila. Real live actual bread. Somehow, we managed to resist cutting into the fragrant little loaves as soon as they came out of the oven and instead, saved them for dinner. The results: the pork belly was wonderfully flavorful, but extremely rich. There’s really very little meat to be had on this cut of pork; it’s mostly fat. Imagine a big slab of roasted bacon and you’ll start to get the idea. I can’t imagine how Gordon fans eat big squares of this stuff. The English cuts must be much leaner is all I can figure. Still, it tasted yummy and the crunchy greasy crackling on top was delicious, a huge hit with the toddler. The bread was the teensiest bit dry (I think I got worried that it would still be gummy inside and left it baking a little longer than I should have), but basically it was good. Nice and crusty on the outside, tender and soft within. The dill flavor was very subtle, and went perfectly with the pork belly and the fantastic roasted vegetables hubby served alongside.